Several journalist and officials were trapped when suicide bombered stormed the national television station in eastern Afghan city of Jalalabad on Tuesday triggering gunfights and explosions. 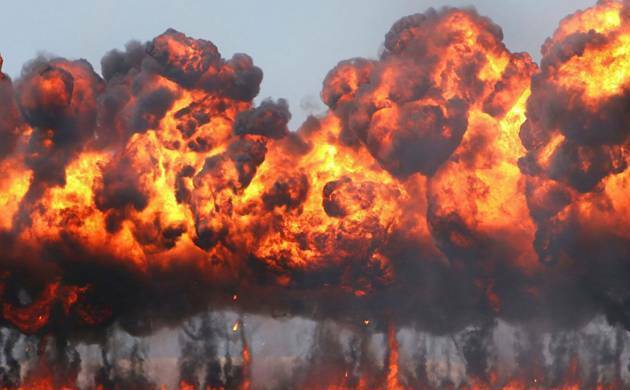 A representational image of an explosion. Militants in Afghanistan have targeted a state broadcaster station in Jalalabad. Several journalist and officials were trapped when suicide bombered stormed the national television station in eastern Afghan city of Jalalabad on Tuesday triggering gunfights and explosions. At least two people were killed and 14 others wounded in the ongoing assault, which underscores the growing dangers faced by media workers in Afghanistan. No insurgent group has so far claimed responsibility for the raid in Nangarhar province, a hotbed of Islamic State jihadists, where the US military dropped its largest non-nuclear bomb last month in an unprecedented attack. "Four attackers entered the RTA (Radio Television Afghanistan) building this morning. Two blew themselves up and two others are still resisting," government spokesperson Attaullah Khogyani told AFP. He had earlier said there were three attackers. "At least two civilians have been killed and 14 others wounded so far," Kohgyani said, with a health worker telling AFP that many of those brought to hospital suffered gunshot wounds. An RTA photographer said he fled the building as soon as the gunfight erupted, but many of his colleagues were still stuck inside. Islamic State insurgents are active in Nangarhar province, of which Jalalabad is the capital. The US military last month dropped the GBU-43/B Massive Ordnance Air Blast bomb -- dubbed the "Mother Of All Bombs" --on IS positions in Nangarhar, killing dozens of jihadists. The bombing triggered global shock waves, with some condemning the use of Afghanistan as what they called a testing ground for the weapon, and against a militant group that is not considered as big a threat as the resurgent Taliban. According to the US Forces-Afghanistan, defections and recent battlefield losses have reduced the local IS presence from a peak of as many as 3,000 fighters to a maximum of 800. The Pentagon has reportedly asked the White House to send thousands more troops to Afghanistan to break the deadlocked fight against the Taliban. US troops in Afghanistan number about 8,400 today, and there are another 5,000 from NATO allies, who also mainly serve in an advisory capacity -- a far cry from the US presence of more than 100,000 six years ago. Wednesday's attack marks the latest militant assault on an Afghan media organisation. Afghanistan suffered its deadliest year on record for journalists in 2016, according to the Afghan Journalists' Safety Committee (AJSC), adding that the country is the second most dangerous for reporters in the world after Syria. At least 13 journalists were killed last year, AJSC said, claiming that the Taliban was behind at least ten of the deaths. In January last year, seven employees of popular TV channel Tolo, which is often critical of the insurgents, were killed in a Taliban suicide bombing in Kabul in what the militant group said was revenge for "spreading propaganda" against them. It was the first major attack on an Afghan media organisation since the Taliban were ousted from power in 2001 and spotlighted the dangers faced by journalists as the security situation worsens. Dan Coats, the head of US intelligence agencies, warned last week that the security situation "will also almost certainly deteriorate through 2018, even with a modest increase in the military assistance by the US". US-led forces have been fighting in Afghanistan for almost 16 years, making it America's longest war.